Vertical Kicking is a fun and different way to work your legs in the pool. Vertical kicking 3 ways: hands above the water, elbows above the water, and arms in a streamline. To vertical kick, all you need to do is practice kicking in the deep end of the pool. You can do any kick (flutter, breaststroke, or dolphin) but some are more difficult than others. 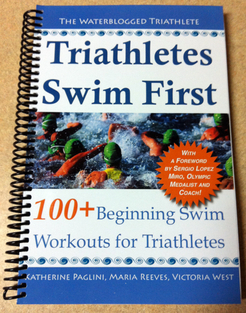 We think breaststroke kick is the easiest, dolphin is a little more difficult and flutter kick is the most challenging. There are many different ways to vertical kick. You can kick with your hands above the water, your elbows above the water, or even with your arms in a streamline position. Kicking with just your hands above the water is the easiest and kicking with your arms in a streamline is the most difficult. Often, when I kick with my arms in a streamline I begin to sink and have to time my kicks so that I’m able to breath when I’m ready to. I have done so many different versions of vertical kicking – everything from wearing 35 lb weight belts to tossing water polo balls or medicine balls to my teammates. I have also passed a 10 pound diving brick back and forth with a partner where the only rule is that the brick always has to be above the water. Sometimes, when I’m vertical kicking by myself, I’ll hold a wet towel above my head and vertical kick with that. I get the towel wet so that it is heavier than it would be if it were dry. Vertical kicking is a good tool for triathletes because it can be used for everything from active rest, to endurance, or even sprint training. It can build ankle flexibility and also help build confidence in deep water. Never practice vertical kicking if you are uncomfortable in the deep end. Never vertical kick alone or without proper supervision. Don’t vertical kick with weights or any kind of resistance unless you are practicing with a team that is properly insured/certified by USA Swimming/USA Masters swimming and you have a certified coach on deck. SWIM SAFE!!! 1. Swam at altitude like that! What a day! I’d kill to get back in that pool now. Swimming at altitude is so tough – I remember the first time I tried swimming in Colorado! I think it took two weeks to feel “normal” in the water! I hope you get a pool like that nearby at some point, they are amazing to train in! Thanks for sharing the link, it is a great facility! Did you only swim in it that one time? Worth a Reblogged, don’t mind if I reblog this on mine tomorrow?? Of course not, go for it!